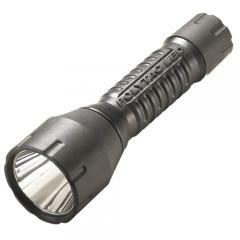 The Streamlight PolyTac LED HP High Performance Tactical Flashlight is the most powerful member of their PolyTac family. Equipped with a white C4 LED and a precision-engineered reflector, it provides a tight 150 lumen beam with consistent illumination out to the edges. It activates usig a convenient push-button tail switch, and features solid state power regulation that delivers consistent output throughout the batteries' life. Made from high-impact nylon polymer with an unbreakable polycarbonate lens, the flashlight is extremely resistant to impact forces. It is also IPX7 rated for waterproofing, capable of being submerged in up to a meter of water for 30 minutes. Do you have a plain leather holder that will fit this light? "Boston Leather Open Top Streamlight Strion Flashlight Holder" or any leather flashlight holders for Strion should work.